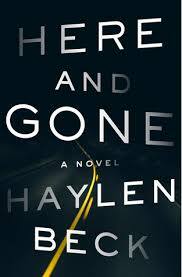 Hereand Gone by Haylen Beck, deals with every parent’s nightmare; losing your child. But for Audra the circumstances are more bizarre than you could image. While she is fleeing an abusive marriage, she is pulled over by a small-town sheriff. Upon searching her car, he finds a bag of weed and Audra is arrested and her children are taken into police custody as well. Upon being booked, Audra asks about their well-being and is met with a blank look and a question that turns her blood to ice; “What children?”. Sheriff Whiteside contends there were no children in Audra’s car when she was pulled over. We soon learn Whiteside has dealings with the black market and the children are being sold to the highest bidder. Beck does a nice job just straddling the line between bringing the horrors of what could happen to the children and the intentions of the bidders, while not delving too much into it. I like my books dark and gritty, but this subject matter is a line that could turn me off of a book if not handled correctly. But even the best laid plans cannot account for variables. One of the biggest variables is Danny Lee, also known as Danny Doe Jai (Danny Knife Boy), who lost his daughter over five years earlier in a similar situation, and he lost his wife six weeks later to suicide after she blames herself for their loss. Now Danny sees a chance at some sort of revenge and redemption. He seeks out Audra and offers his unique brand of expertise to her in an attempt to determine what has befallen her children, and perhaps get some answers to his own situation. I was originally attracted to this book through the blurbs from some big-name authors. Seemed intriguing to have some very popular authors to blurb a new author. Turns out Haylen Beck is a pseudonym for Stuart Neville, which explains the high praise. Smart move to release this under a different name, as I may not have read it if it had Neville’s name on it; not that I don’t like him, I just perceive him to be an Irish author whose one book I sampled didn’t grab me and I would have bypassed this book based on this previous exposure to his work. I am glad I didn’t miss this one, it was a great read.